Airtab® Installation Instructions – Please read before starting……………………. All work should be performed with due care and in accordance with all existing Health & Safety regulations. The recipient vehicle should be on level ground with brakes applied and wheels chocked. A secure work platform should be used as most fitments will require access from an elevated position. Have a rubbish bag available and ensure that the backing paper is carefully disposed of. Do not let the backing papers accumulate underfoot, they are slippy. Ensure that the position you decide to fit Airtab does not take the vehicle out of maximum width regulations. Airtabs™ should be installed when vehicle skin temperatures are at or above +40F (+5C). The surfaces must be free of all contaminants. Airtabs™ should be installed on warm, clean, dry, flat surfaces. If a degreaser is used, it must be completely removed before installation. The final cleaning process should use a cleaning agent such as rubbing alcohol or paint thinner. The use of Tack Rags can also provide a good surface preparation. Do not use any cleaners containing ammonia. All cleaning products should be used in accordance with the manufacturers Health and Safety instructions. Use clean rags or paper wipes during the preparation process. In conclusion, for installation purposes, the cleaner, the dryer, the warmer, the better. Airtabs are to be spaced 1”( 25mm ) apart for optimum performance. Increase spacing if necessary to compensate for changes in vehicle body shape, rivet heads, lights, etc. Do not decrease spacing as this will decrease performance. Prior to commencing the fitment, plan the position of the Airtabs carefully, taking the previous points into consideration. Use a tape measure, Ruler or make a simple template to assist in correct spacing. 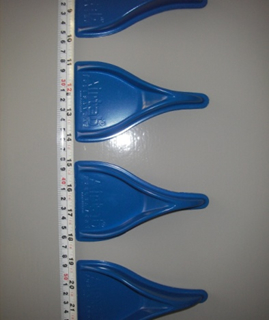 Use of a plumb line will assist in obtaining a straight vertical row, or a tape measure can be attached to the vehicle with duct tape, this can be used as both the straight edge, and spacing guide ( see photo ). Peel the backing off the first Airtab, position carefully and apply to the vehicle. Press down firmly to ensure good contact and full adhesion. Continue fitment with your chosen method of spacing. Full setting of the tape will take up to 24 hours but vehicles will be operational after 15 minutes. The warmer the temperature, the faster the adhesive will set. To assist in smoothing airflow and reducing drag at the back of a vehicle, Airtabs should be installed as close as possible to the rear edge. They should be positioned within 18”( 460mm ) of the back for optimum performance. - Airtabs help in bridging the gap between Tractor and Trailer or Cab and Body . This area is a significant contributor in overall vehicle drag. Fit Airtabs down the sides and across the Cab Roof to assist in this area. Airtabs also work in concert with Air deflector kits ( if fitted ), further improving performance. - Airtabs are effective at reducing turbulence entering undesirable areas, such as wheel arches. Fit Airtabs on the vehicle body, directly in front of these areas to reduce resulting drag.